Welcome to Shaw Website Design Group's Java programming Language Bubble. No matter what your skill level, Shaw has a wide selection of Java programming bubbles that offer up a wealth of resources to seize your interest and guide your learning experience. James Gosling, back in 1991, led a team at Sun Microsystems that developed the first version of Java. One of the stories behind the name is that during a never ending meeting about what to actually call the program, they went out for coffee and it was there they had a eureka moment. Java is considered a general-purpose object orientated programming language that is a good fit for most applications, whether it accesses the Internet or not. Object orientated programming is a programming methodology that uses objects that interact with each other by means of actions. The actions that an object can take are called methods. Objects of the same type are said to be in the same class. All objects within a class have the same methods. Thus, in a simulation program, all airplanes have the same methods (or possible actions), such as taking off, flying to a specific location, landing, and so forth. The following Shaw Website Design - Java Programming Language Resource Bubbles have been gathered from around the web and will be periodically updated. 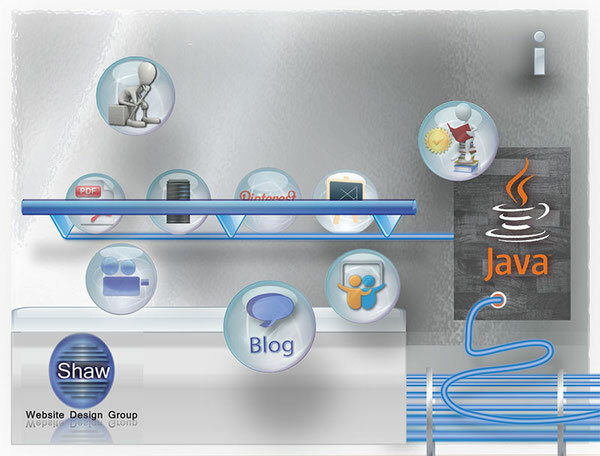 Shaw Website Design Group - Helping tickle your Java Programming Curiosity. Use Shaw to learn Java, one programming bubble at a time.